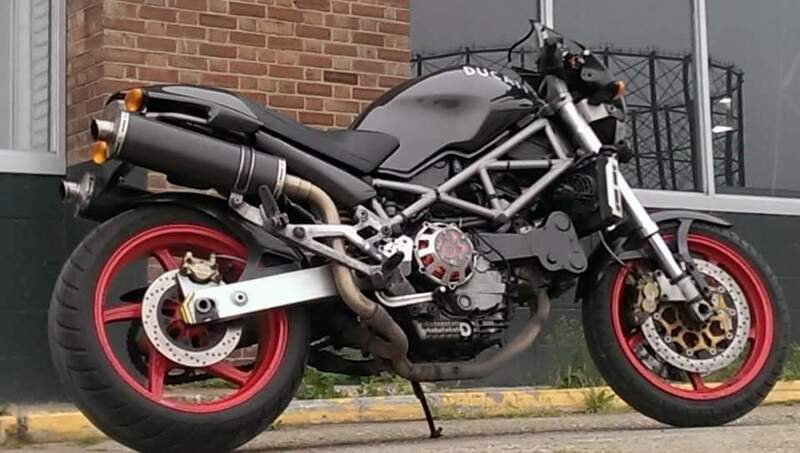 Ducati Monster S4 , Stolen from London SE5 Camberwell are, south London 2 weeks ago.. chained up with disc lock on and cover, alarmed and immobilsed. Black tank and rear seat cover, with period Ducati decals.., red Marchesini wheels, carbon screen, carbon side panels, carbon hugger and front mudgaurd, carbon Leo Vince pipes, carbon sprocket cover, carbon chain cover, alloy billet open clutch cover, alloy billet rear brake cylinder guard, red and black anadized adjustable brake and clutch levers. carbon clutch plates and magnesium clutch basket. parked up on a side street on a well lit road, disc lock on chain and padlocked and covered, alarm and immobilser on. last seen at 10pm monday 25th march..